getcalc.com's Mean (μ) Calculator is an online statistics & probability tool to measure the average of sample or population data or to summarize the common behavior of sample or finite population data in statistical experiments. Users also generate the complete work for mean calculation for any given valid input values by using this calculator. What is Mean, Median & Mode? Mean is a mathematical function or method used in the context of probability & statistics often symbolized by μ to represent the average of group of elements. It's a central point of all sample or whole population data, generally calculated by summing up all elements divided by the total number of elements in a group. Mean is the most important statistical function to analyze the common behavior or characteristics of collection of data. The mean for population data summarizes the common behavior of finite population elements. The mean for sample data summarizes the common behavior of sample data, from which the characteristics or common behavior of large size or infinite number of elements in an experiment is estimated. Use this mean calculator to find the common behavior or the average of group elements in a statistical survey or experiments. Median is a mathematical function or method used in the context of probability & statistics represents the middle element of a group of elements, after arranging the group of elements in the descending order. The average of two middle elements is Median, if the count of elements in a group is even. Mode is a mathematical function or method used in the context of probability & statistics to represent the most popular or repeated elements in a group of samples. The mode is none, if there is no popular or repeated elements available in the group. It shows all most popular elements as Mode, if the group of elements or instances have more equal number of combinations. The below is the mathematical representation for mean calculation. 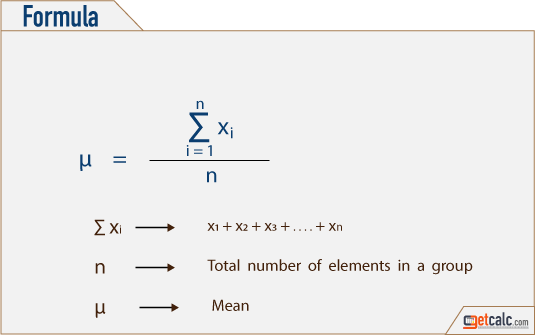 Mean is an important statistical method used to find standard deviation, standard error, confidence interval, coefficient of variation, Z-score, normal distribution, Poisson distribution, exponential distribution, t-distribution, variance etc. The below solved example for mean calculation may help grade school students, beginners or learners to understand how to calculate mean in statistical surveys or experiments. It shows the common behavior of whole elements in a group or what is the actual results of the current process rather than the expected results. In other words, it represents how close the actual results of experiments from the expected results when it dealt with standard deviation calculation. 8.6125 is the mean for dataset 7.5, 9, 8.2, 7.9, 9.5, 9.7, 8.1 & 9 from which the standard deviation about to be measured to estimate the common variation of the sample or population dataset from its central location. step 2Since the total number of elements in the dataset is 8 (EVEN number), the median is the average of 4th and 5th elements (two middle numbers) for the above dataset. This calculator, solved example & mean, median & mode calculation work for any given valid input data may helpful for grade school students, beginners or learners to understand, practice & verify the results of different set of elements collected under various circumstances for statistical surveys & experiments.